It is based on the use of a filter made of meshes that allow to water to pass but retain particles. 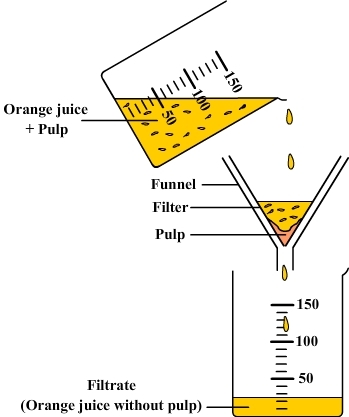 We can observe that the filter retains particles of pulp whereas liquid flows throught fillter without them. A filtration is a process that withdraws solid particles from a liquid therefore it provides a homogeneous liquid. - The liquid which is obtained from a filtration is called "filtrate". - This is a quick method of separation but its effectiveness depends on the mesh size.